This winter will be mild those in the know promised. I was pleased, particularly after last year’s frigid, snowy winter. That was the winter in which Polar Vortex rose to television stardom in North America. PV’s success must have weather reporters feeling quite smug over having had the foresight to pluck him from his many years of service as a common descriptor used often in scientific publications and groom him for promotion to the evening news. With viewers now blasé to reports of “winter cold snaps” and “Arctic air parcels” this new kid in town could evoke visions of a wicked cyclone of icy air sucking up and leading to the demise of everything its path. That same year, while Canadians dodged whirling, polar, death-spirals, UK residents scurried for shelter from new, apparently equally deadly, “weather bombs” predicted to drop from the skies. How lucky that these weather phenomena suddenly showed up, fitting so well into today’s sound-bite driven news reports and the character-limiting world of tweets. What convenient rating boosters they turned out to be for the otherwise humdrum business of delivering bad news on the weather front. The winter air circulation over Canada this year is much kinder. Late last spring, the trade winds that blow from east to west over the equatorial Pacific Ocean began to weaken, halting the usual multi-molecule pileup of warm water in the western Pacific Ocean. These lighter trade winds, which sometimes reverse their direction, allow the festering pile of tropical water to flatten out and move east back across the equatorial Pacific Ocean towards South America. The band of warm water arrives on the coast of South America around December. This means that the typical upwelling of cold water off the coast of South America stops when it becomes trapped underneath the less dense warm water allowing surface-water temperatures to increase further. South American fishermen, noticing this irregularly occurring event happening in December, dubbed it El Niño or “boy child” a reference to Child Jesus. He has a sister, La Niña, but that’s for another day. 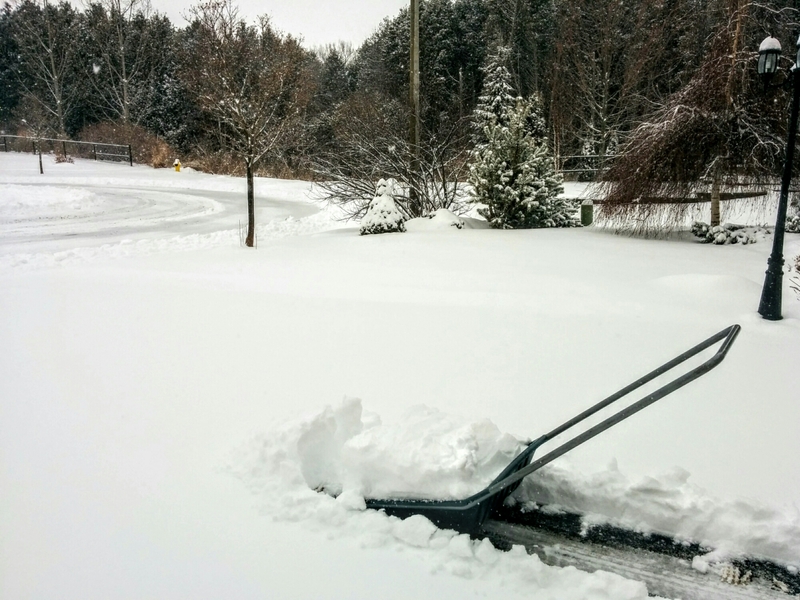 The El Niño-altered wind and ocean conditions affect weather patterns around the world and for central Canada its intensity this year would mean an abnormally warm and dry winter. And so it began. November, that cold and brown month, was warm and green; my flowers still bloomed and my parsley still grew. In December, temperatures rose into the teens hitting 15°C on Dec 23rd, the highest in recorded history. My heating bills were low, winter driving was a breeze, El Niño and I were good together. Then our relationship changed. A friend from the UK chose to visit Canada for the first time in early January. Despite being simply a backstop when his plan to visit either Belize or Norway fell through, I enthusiastically took on what Canadians foolishly feel compelled to do when new tourists arrive: either dispel the myth that we live in a permanently frozen wasteland by showing them a particularly, better yet an uncomfortably, hot and humid summer, or reinforce the myth by showing them the coldest, snowiest winter imaginable while feigning indifference through appropriate shoulder-shrugging. How could I possibly achieve the latter with El Niño playing havoc with my winter? 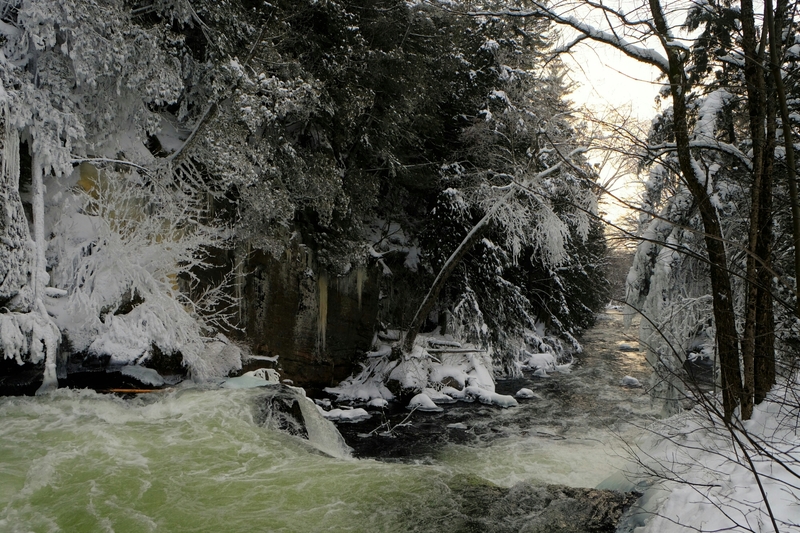 The ski resorts were not open, the forests to the north had little snow, the skating trail through the woods was a stream of water. I looked further afield. 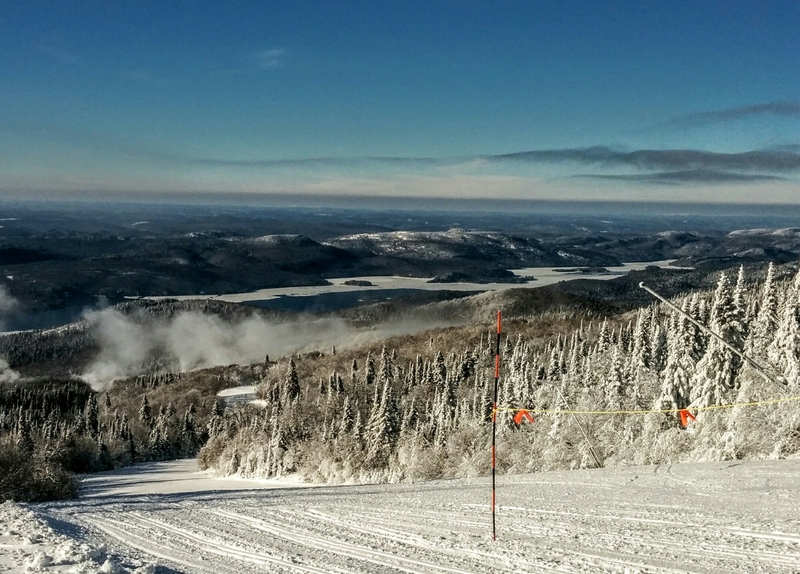 Mont Tremblant ski resort in Quebec had managed to coat its ski runs with enough man-made snow to open for business and, as luck would have it, a couple of anomalous days this winter were due to bring nice brisk temperatures of -20°C to Ottawa and surrounding area. It seemed a shame to pack someone, who had recently flown for 7 hours, into a car and then drive him for another 4 to 6 hours but it was necessary, duty called. 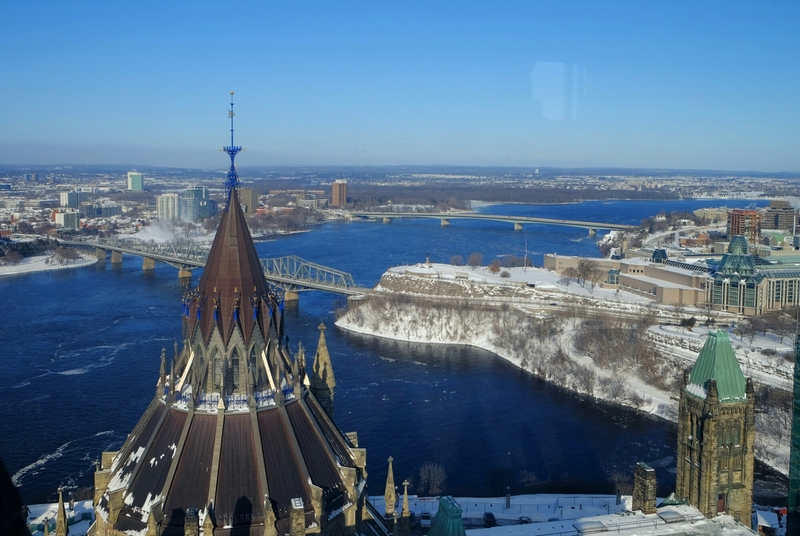 We timed the trip to Ottawa and Quebec to coincide with the only two -20°C days thus far and although by Ottawa standards there was only a dusting of snow, it might be enough to fool tourists. 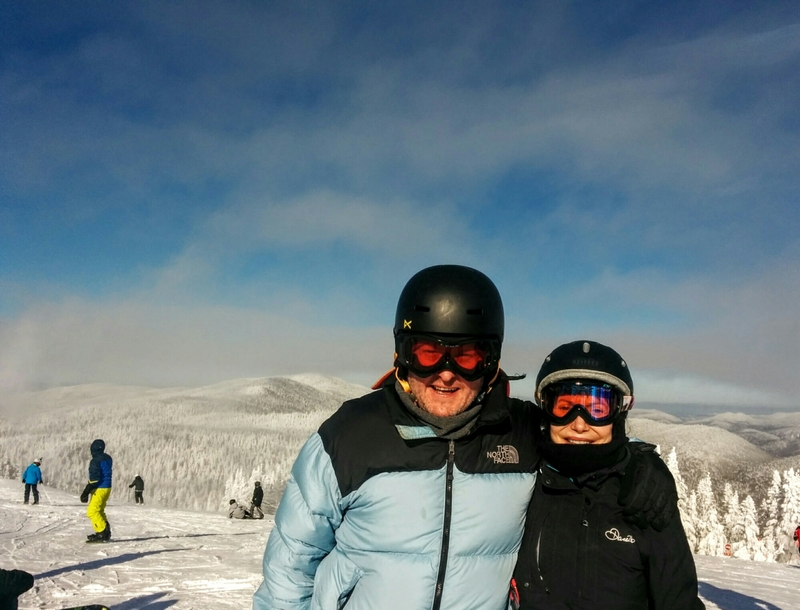 He said he had never experienced -20°C. “It’s nothing” I replied, shrugging my shoulders. Also, by neglecting to mention that the thick snow cloaking the trees on the Mont Tremblant ski slopes was simply from the snow-making guns, I think I successfully defeated El Niño for a few days. 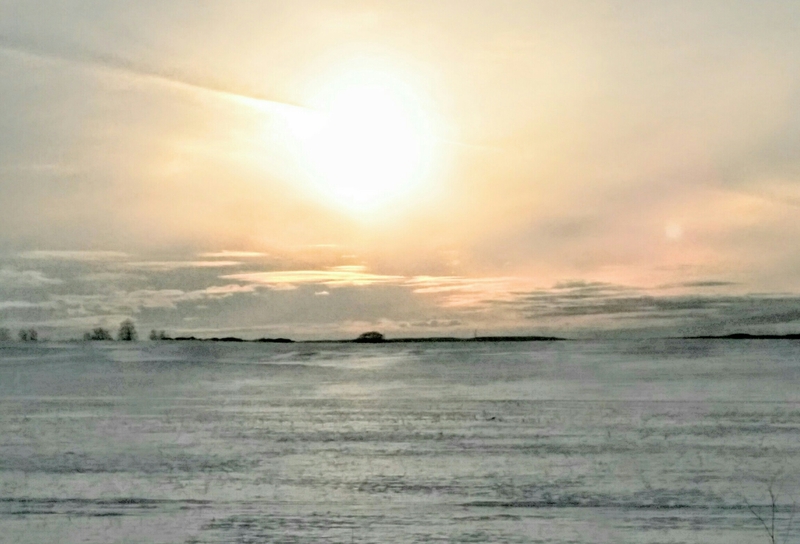 I managed to perpetuate the frozen wasteland rumour and, as a result of the sunshine we had, I might have even elevated the impression to a frozen wonderland. Then it was on to Algonquin Park a bit further north. 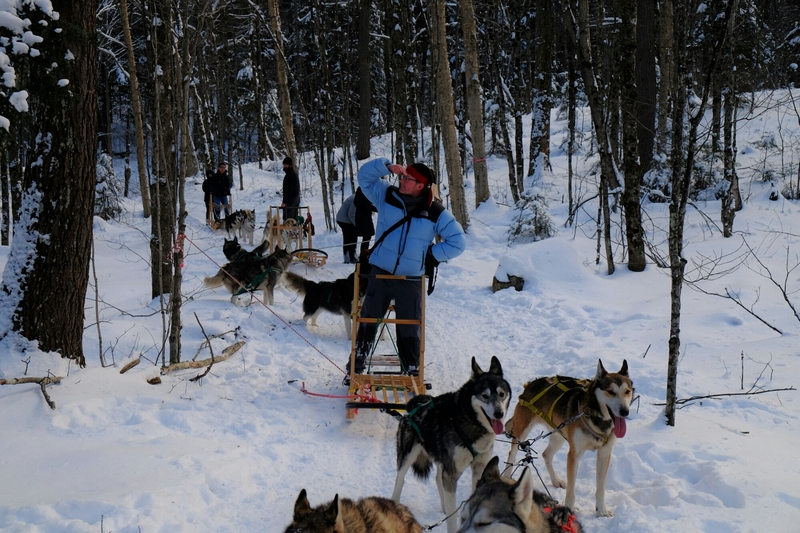 Dog-sledding there hadn’t started due to lack of snow, but with a quick email to someone I knew in Haliburton I found a place that was open. 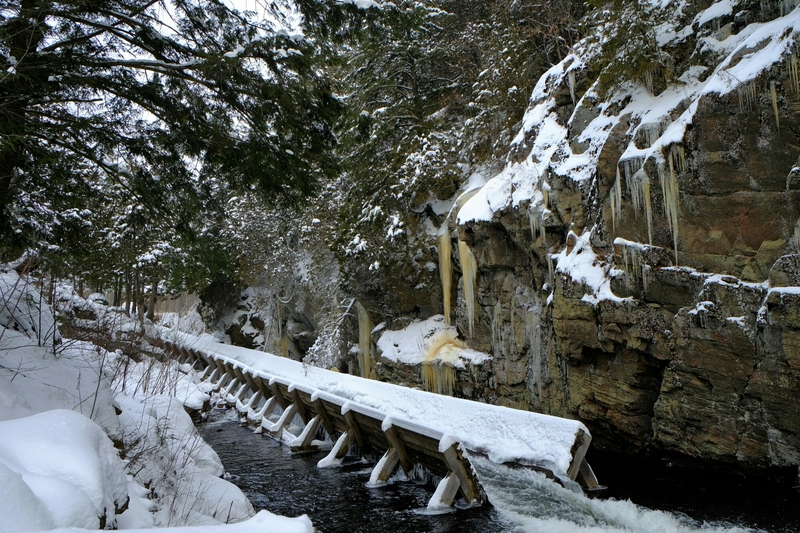 He also found us enough snow to snowshoe to the Big Hawk Lake log chute, the only one of its kind left in Ontario. It was one of hundreds used in the 1800s and early 1900s when Ontario was extensively logged. By way of a few cold nights it had produced a few icicles suitably in keeping with the frozen fairyland theme. The dog-sledding wasn’t quite as successful. The dogs refused to run (I suppose they didn’t need to run this year to stay warm) and instead ambled along the trail as if on a Sunday stroll. It was enjoyable even if it didn’t measure up to the exhilarating race across a frozen lake that my friend had previously experienced in Norway. 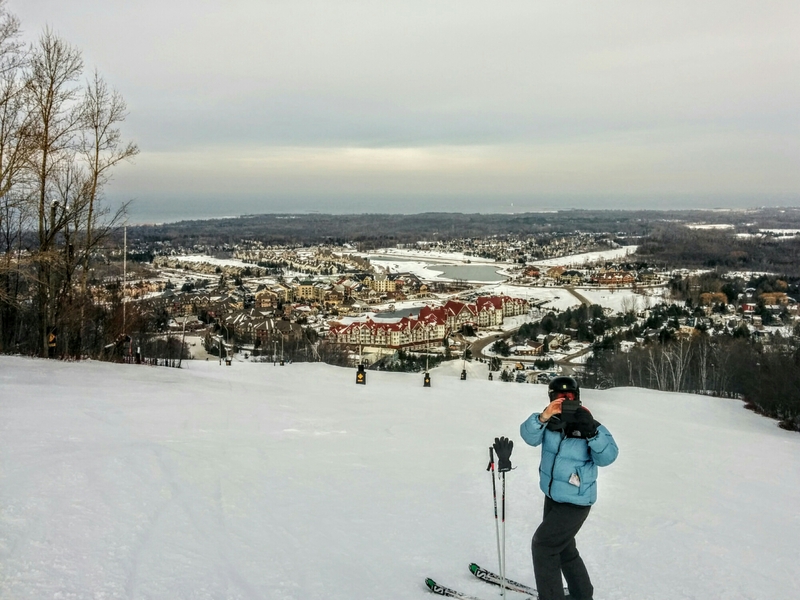 We also squeezed in a day of skiing in Collingwood, Ontario. The resort had only just opened (its latest opening ever) and again it was mostly man-made snow but there seemed a silent understanding that this was not a topic for discussion. 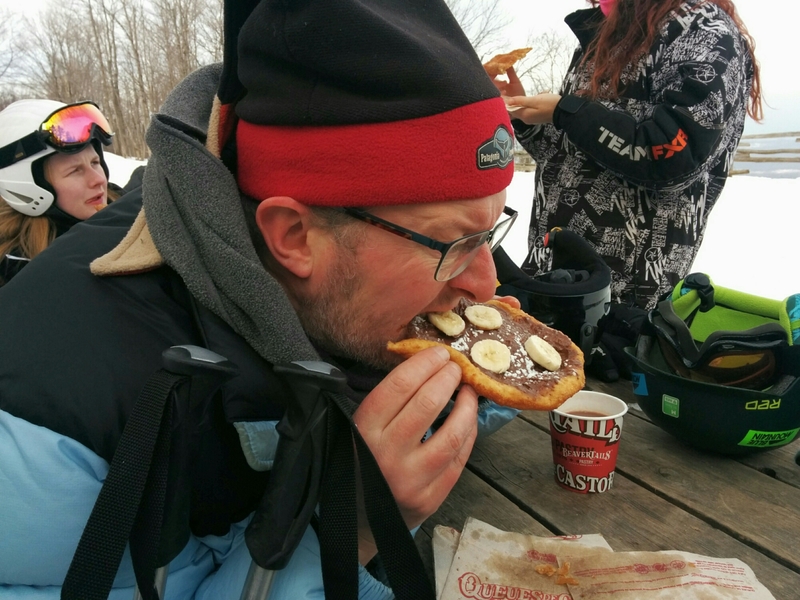 The highlight for him, in any case, seemed to be eating beavertails at the top of the hill. Fortunately, on the two-hour drive home my tourist slept and missed seeing the almost snow-free countryside. El Niño was getting on my nerves, I didn’t know how long I could keep up the charade. An ice rink in Toronto was our last stop. We didn’t skate but just looked, which made it harder to tell that the ice was mushy. Then, with my friend safely on a plane home, El Niño and I reconciled our differences. I began once again to enjoy his company until +10°C and rain cancelled my weekly ski day in Collingwood. The Great Lakes have not frozen at all this winter and the lack of snow pack on the land could mean drought later this year. The last straw was yesterday when I reflected on the fact that this is my first full winter not working. I no longer had to battle winter blizzards and icy roads at 6 am on my daily, 80 km commute to Toronto. Surely, I now deserve to drink my morning tea and gloat as others continue the white-knuckle drive in wintry conditions. Instead, the roads have been dry and bare for the most part with little need even for winter tires. I’ve had enough El Niño, you’ve over-stayed your welcome; go home. No wait. Today I woke up to fresh snow. It is still snowing and will be all day. I have to go outside now and shovel it. 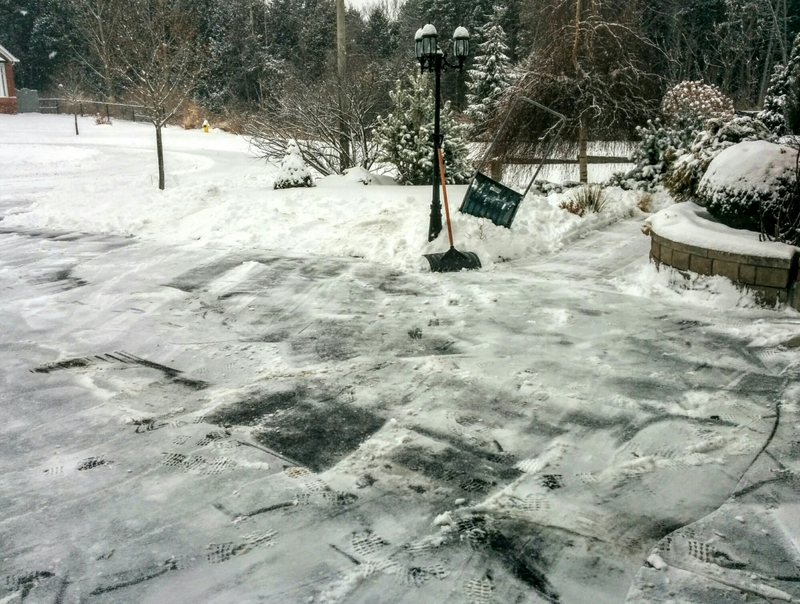 There; but I shall likely have to shovel it again tonight. I’ll make you a cup of coffee El Niño. Perhaps you’d like me to rub your feet? Anne this is really excellent, you win the prize.